STUDENTS from Haslingden found themselves in a drama when on a visit to Valencia when they were caught up in a commotion when a fan threw a tear gas canister. 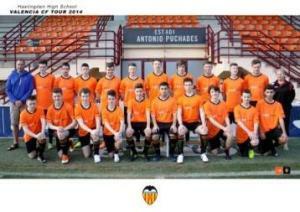 The party of 35 students from Haslingden High School had spent 10 hours in football training over four days with one of the world’s top teams Valencia, when they sat down to watch the Villareal match against Celta Vigo. In the 85th minute a Villareal fan through what was thought to be a smoke bomb but it turned out to be a tear gas canister and the game was suspended and the stands cleared. The Haslingden High pupils all got out safely thanks to the expert support from staff. The students, most of whom play for the school’s teams, also had to cope with 25C heat while they trained on the pitch where the Valencia professionals were also being put through their paces. Among the famous names they spotted was Brazilian born Diego Alves who has been Valencia’s goalkeeper for nearly three years. After all the training they put their skills into action when they played the Spanish teams. The under 15s lost 5-3 while the under 16s lost 1-0, but Head of PE Wes Howarth said the match was closely fought and man of the match went to Ryan Siddle, 16, a centre midfielder. Next year, as Sixth Form students, they will get the chance to play in the North West Colleges League when matches will be held every Wednesday in school.